How to Restart, Sleep or Shut down Windows 8? Some people are having problems with windows 8. 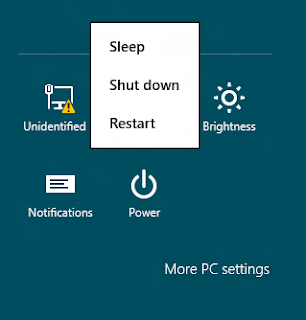 A little problem that the people have is how to restart, shutdown, or sleep the windows 8. We have some useful tricks for you to do this you have to follow the below tricks. · First you go to the right side of the screen and pre windows key with C, when you do this a charm option will appear. · Just go to the charms menu and click on the setting button. · Then you have to click on the power button and then chose what you are wanted to do like shutdown or restart. There is another thing that you can also create shortcut for the shutdown, hibernate, restart and sleep options and then you can do this faster. If you want more tricks and tips about windows 8 then stay in touch with our site.